Ankle sprains are one of the most common sporting injuries, with ACC reporting they take up 10-15% of all sporting injuries! And 20-40% of these go on to develop residual or long term symptoms, with a high chance of recurrence. This is an appalling figure, and one that could be so easily minimised. So here are PhysioSteps top 5 tips, to ensure you have the best possible ankle recovery following ankle sprain. RICE! We can’t stress enough the importance of good treatment with RICE. And this isn’t just a once off ice pack straight after the injury. It means ongoing management with ice, compression and rest for the next 48-72 hours. If you would like more information on how to apply the RICE technique, then click here. Keep moving! It is important to avoid developing weird and wonderful walking patterns. It is ok to limp and keep weight off it, but try to ensure that your foot lands as straight as possible. See a physio quickly! If you have applied the RICE technique above and adhered to it, then there is no need to see a physio in the first couple of days following injury. However, no, your ankle isn’t going to come right by itself! We hear this so often in the clinic, with patients having waited for 2-3 or even more weeks for their ankle to get better, only in the end having to come and see us anyway. Trust us, the fastest and cheapest route is to see someone as soon as you can. Stick to the exercises! Your physio will develop an exercise plan with you, to take you from barely being able to walk to being back to the level of sport or movement that you require. They prescribe certain exercises and certain sets and reps for your benefit only, so if you stick to it, you will see a much faster and better recovery. Go the whole way! Very often with ankles, once the pain dies down, people think they are healed. Unfortunately, when you sprain your ankle, you lose a lot of the foot-eye coordination that your brain provides, and this takes practice and specific exercises to gain back. As this is something you can’t feel, most people don’t realise the importance of it. This important point is the one that is often missed and is, in general, the reason why there is such a high re-injury rate with ankles. Your brain forgets the fine tuning part of moving your ankle and therefore you lose the fine control you once had. Once you are at the tail end of your ankle rehab, your physio will prescribe you exercises to build your proprioception (foot-eye coordination) and agility to a level that suits you. So there you have it, ankle rehab faster and more effective with 5 easy steps. 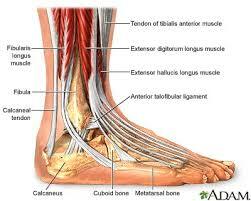 We hope this helps the 10-15% of you out there that may one day sprain their ankle…now you know what to do! Look after body – you only get one of them!